Step 1: Open www.bse.telangana.gov.in in any web browser, then following web page will be displayed. Then click on “NTSE” link which is displayed at left side bottom of the web page (rounded in red color). Step 2: Following screen will be displayed, then click on the link “NTSE Application” (rounded in red colour). Step 3: After clicking on the link “NTSE Application” then the following screen will be displayed. You have to enter the User Id and Password (rounded in red colour) to open the application form. Step 4: After login, the following screen i.e. 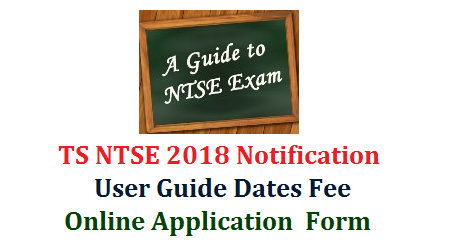 NTSE Application Form will be displayed to make necessary entries of the students appearing NTSE November-2018. Step 5: Fill all the columns in the application and upload the photo with signature by clicking on browse button (example shown above). The size of the photo with signature should be less than 30 KB and format should be of image. And upload Caste , Non Creamy Layer and Medical certificates by cliking the browsers in case of SC/ST/OBC/PHC. After filling all the details, click on “Submit Application” (rounded in red colour) and take the printout of each application. Enter the details of each student one by one in the same procedure. Step 6: After uploading the details of all students, click on “Report” at the top of application form. Then click on “PDF” link (rounded in red colour) for display of Nominal Roll. Step 7: After clicking on “PDF” link, the following screen will be displayed to take printout of Nominal Roll. Step 8: Take a printout of Nominal Roll and submit the following in the O/o the District Educational Officer concerned. Two sets of Nominal Rolls attested by the Head of the Institution concerned. Application of each candidate attested by Head of the Institution concerned (Attested copyof Caste and Medical Certificate in case of SC/ST/OBC/PH, and Non creamy layer certificate in case of OBC shuld be enclosed).